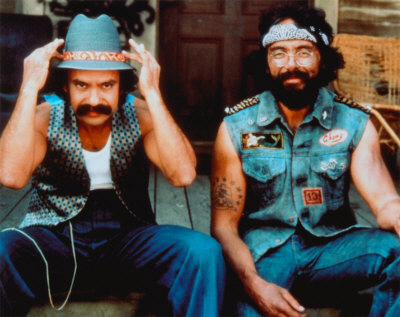 Cheech & Chong are a comedy duo consisting of Richard "Cheech" Marin and Tommy Chong, who found a wide audience in the 1970s and 1980s for their stand-up routines, which were based on the hippie and free love era, and especially drug culture movements, most notably their love for cannabis. The duo released many successful comedy albums, and starred in a series of low-budget films, becoming a successful comedy team. Some of their best-known comedy routines and songs include "Earache My Eye", "Basketball Jones", "Santa Claus and His Old Lady", and "Sister Mary Elephant". Perhaps their all-time most famous line is "Dave's not here", from their self-titled debut album. Their early success culminated with the release of their first feature-length movie, Up in Smoke, in 1978. 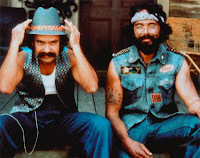 Relatively successful, it became something of a cult classic and was successful enough to warrant a sequel, Cheech & Chong's Next Movie, in 1980, and Nice Dreams in 1981. The pair attempted to shy away from stoner comedy with 1984's "Cheech & Chong's The Corsican Brothers" but the film was universally panned by critics and fans alike. They also appeared in smaller supporting roles in Graham Chapman's Yellowbeard and Martin Scorsese's After Hours. 0 comments on "Cheech & Chong - Live, Tucson, Arizona 1972"